There’s no doubt about it: Hardwood floors are beautiful and timeless. But their upkeep and care is difficult, and they are prone to scratches, dings, and more. Plus, hardwood flooring can be very costly. Because of this, many consumers have opted for laminate flooring instead of hardwood, getting the look of hardwood without the cost or hassle. But vinyl plank flooring has recently upped its game and is a fair contender with laminate flooring. See how vinyl planks and laminate flooring compare to each other before you jump into new floors. When it comes to appearance of vinyl planks or laminate flooring, modern technology has come a long way. It’s easy to find a beautiful floor that looks like real wood, stone, or another material, thanks to 3D printing. Both types of flooring come in countless colors and finishes. 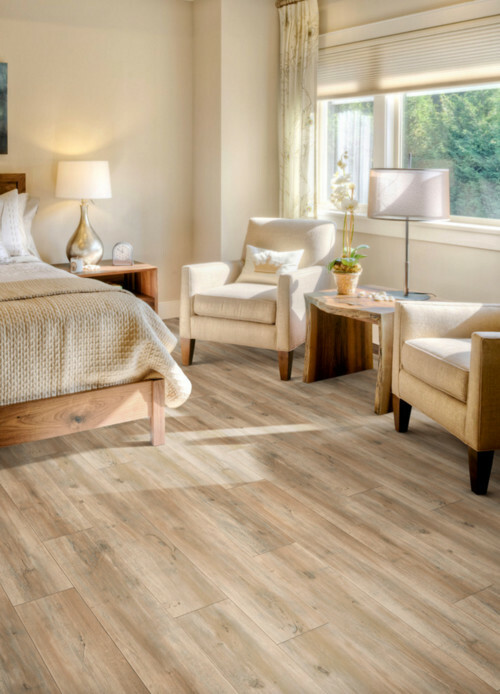 When installed correctly, vinyl plank is waterproof, as it is made of 100% synthetic material. Laminate’s surface, on the other hand, is a hard plastic laminate while the core layer is made of wood byproducts. Manufacturers have created water resistant laminate, but because the core layer contains wood, laminate is never waterproof. If exposed to water, the core will soften and swell and the floor will be destroyed. This makes vinyl a better choice in bathrooms and other high-moisture areas. Both flooring types are very durable, with some slight differences. Vinyl expands and contracts, making it an ideal flooring choice for high-traffic areas. It is also not prone to scratching from children running around or from animal claws. It can be ripped, however, when heavy furniture is dragged across it. Laminate flooring is also durable and resistant to damage. However, it can be scratched or chipped over years of heavy use. While laminate can fade over time, it is more resistant to fading than vinyl. Vinyl flooring can be cleaned with a steam mop or wet mop and you never need harsh cleaners. It’s important to know that a wet mop should never be used on a laminate floor. However, laminate floors can be cleaned with steam mops and laminate-specific products. There are also products that can restore shine to laminate floors, as well as to repair scratches and chips. In most cases, laminate is a more comfortable floor than vinyl. This is because it’s thicker than vinyl, and often is installed over a foam underlayment. Vinyl flooring, on the other hand, is installed directly over the concrete subfloor, making it colder and harder than laminate. However, vinyl is a quieter option. Both laminate and vinyl are good floors for DIY projects. Vinyl flooring with a tongue-and-groove design will click together easily, and cutting the pieces is a cinch because all you need is a utility knife. You’ll need a hand saw or circular saw for laminate flooring, and you’ll also need to apply an underlayment over the subfloor. But with a tongue-and-groove design, the installation process of laminate is also relatively easily. Again, vinyl planks and laminate are very similar when it comes to cost. In big-box home improvement stores, you can expect to see a range of $.50 to $3.00 per square foot for vinyl planks. Laminate will run you about $1.00 to $3.00 per square foot. Of course, designer choices at specialty flooring stores will be more expensive. The two flooring options are similar in so many ways, so making a choice really comes down to the factors that are more important to you. If you need help with flooring options, let New Life Bath and Kitchen in Orcutt help you make the right decision for your home and the way you live. Older PostWhat Is an Open-Concept Kitchen?